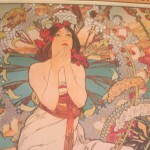 Two years ago at the Kent poster sale, I bought a print created by an artist named Mucha. I knew nothing about this artist or anything about his history. 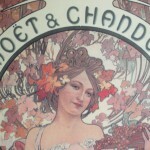 However, I was attracted to one particular print titled Bieres de la Meuse and decided to buy it. During my stay in Prague, I finally discovered the history behind this print. As the group and I were walking down one of Prague’s cobblestone streets, we passed a museum that was dedicated to Mucha’s work. It then hit me that he was from the Czech Republic. 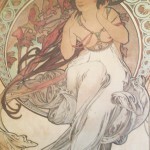 According to Mucha’s bibliography, he was a key figure in the Art Nouveau movement and lived from 1860 to 1939 in the Czech region of Moravia. 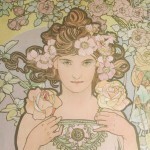 He is mainly known for his paintings of women which are usually surrounded by an intricate design of flowers. His work, however, was not limited to paintings and drawing. Throughout his life he also created pieces that could be found in advertisements, theater settings, and illustration designs of all sorts. Part of my family heritage can be traced back to the Czech Republic. Since I was a little girl, my grandmother has told me stories about my great grandparents and their experience with the Czech culture. It’s amazing to think that for the past two years I have had a print hanging in my room that was from an artist connected to my family’s place of origin. Also, that it took a trip to Prague to finally realize that one of my favorite works of art originated from the Czech Republic. 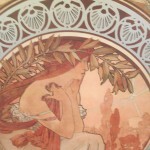 Gallery consists of pictures photographed by Leah Heiser at the Mucha Museum in Prague.